Mount Airy Contemporary 25 West Mt Airy Avenue, Philadelphia PA (267) 270-2787 Gallery Hours by appointment Also open during POST, October 19th and 20th, 12-6 PM. Mount Airy Contemporary is pleased to present the works of Brad Litwin and Jonathan Eckel, both Germantown-based artists. Drawing on his background as an engineer, musician, and artist, Brad Litwin constructs kinetic sculptures that integrate all three practices seamlessly. 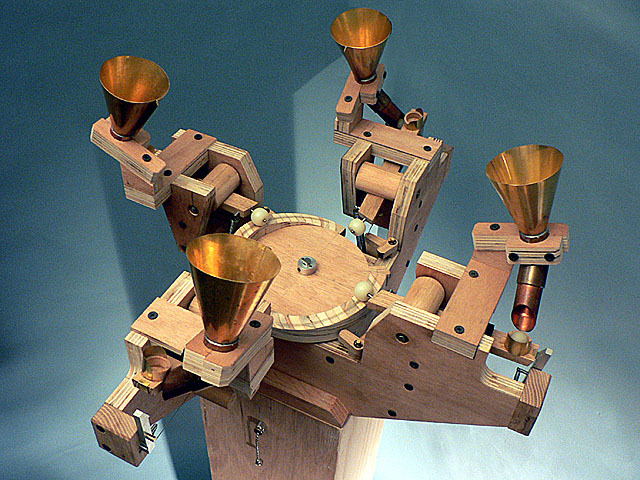 Rhythmic, syncopated machines crafted from wood, brass, copper, motors and electronics toss marbles in lazy arcs into waiting funnels, or play nonlinear melodies that vary based on the interaction of gear ratios. Jonathan Eckel's paintings exhibit a cadence that stems from a very process-oriented approach. Where Litwin's sense of rhythm is a product of meticulously selected initial conditions, Eckel's patterning is rooted in an ongoing intuitive dialogue with the work in progress. Decisions are made mid-stream, based on what's been already laid down. Eckel places a great deal of trust in a working method where the end result isn't previously known to the maker. A painter's painter and a colorist by nature, Eckel creates paintings that complement the mechanical constructions by Litwin. Both artists infuse their work with a kinetic, dynamic tempo born of their working methods - very different processes - that, in this exhibition, converse in the language of music and motion.